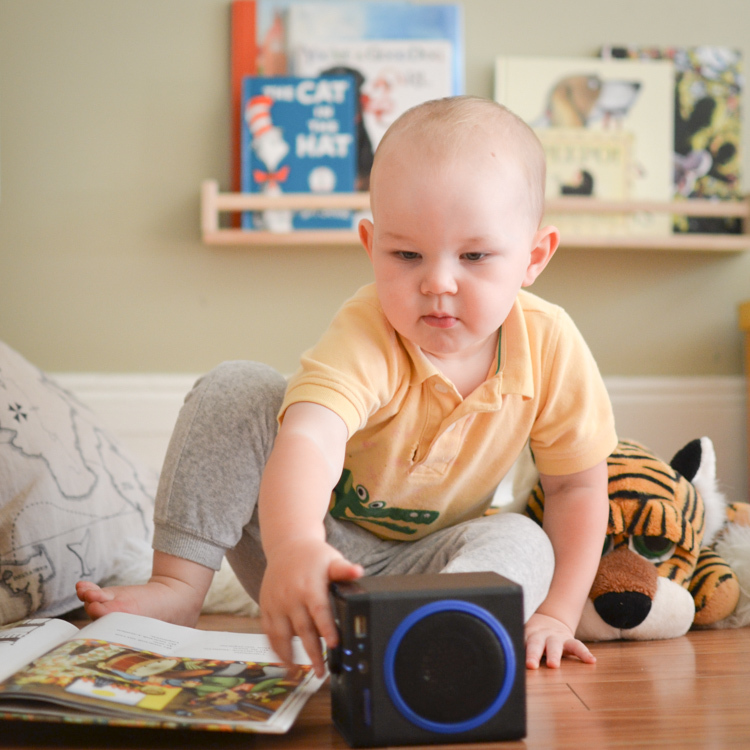 If your toddler can listen to books for hours, maybe he or she is ready for audibooks? Record audiobooks for your kids and win yourself a little time for coffee while they’re enjoying their favourite stories! When I was a little girl, I had a couple of vinyls with children’s stories. The image is bright in my mind: after a day of running in the sun at our summer cottage, I would sit next to the table and listen to the recordings for the hundredth time. When as a grown-up I discovered audiobooks, I was delighted. I don’t listen to audiobooks all the time, but I often turn audiobooks on when I paint or do crafts. When we were moving across North America, from Saskatchewan to Southern Ontario, we also listened to one disk after another of audiobooks on our way. We have listened to half of Gone with the Wind! While the idea of getting a couple of vinyls to recreate my childhood memories for my children was romantic, I decided to go with audiobooks. They are accessible, and there is plenty of choice. So, I have been collecting children’s audiobooks since before my eldest was born. The Finn Family Moomintroll, narrated by Hugh Laurie, stands next to the spectacular BBC dramatization of Winnie-the-Pooh. But the problem was, all those children’s books that I got required a longer attention span than a one-year-old is capable of. I needed something shorter, much shorter. So the questions was, what is available for toddlers? My son loved books from the time he was a baby. When he became a toddler, he could listen to them for as long as I could read, and the same titles got chosen over and over again. Audiobooks couldn’t become a substitute for the times we spent together cuddled with a book, but once in a while, when he was dying to read Goodnight, Goodnight, Construction Site in the midst of supper preparations, I sure wanted a recording of one. But paying $10 for a five-minute story? It wasn’t affordable, at least not for us. Instead, we made a few recordings of his favourite books. Naturally, they are for personal use only: for our boy to sit down and look through his books, while a familiar voice of Mommy or Daddy reads the story through the speaker. A few years later, when our daughter reached the same age, our son participated in recording the books for her. She loved the stories he recorded and giggled when she heard him meowing on the speaker as he recited one of her favourite stories Hairy Maclary Scattercat. That was a great experience for her and for him! Recording books is not difficult for anyone with the use of modern technology. All you need is a microphone. Most laptops come with built-in microphones, and so do tablets and smart phones. Find an app Voice Memos. It is a standard app for an iPhone. Press the red button in the centre and start reading the book. Press the red button again when you want to stop recording. At this point, your recording is paused. So if you need to take a break in the middle of the story, you can do this and then press the button again to keep recording. But if you finished, press “Done”. The app will suggest that you give a name to your file. 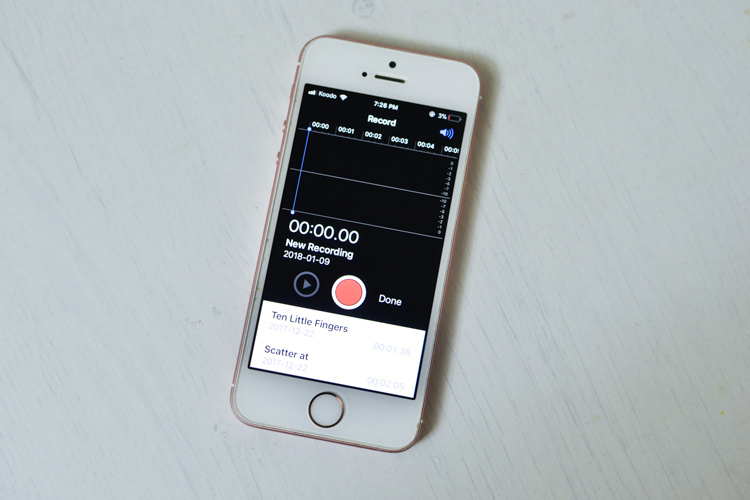 Press “Save”, and the recording will be added to your list of recordings. The format of iPhone recordings is m4a. It will play on your iPhone and your computer. If you need to convert the recording to mp3 for using with an mp3 player, you can convert it on-line. I did it here. Most laptops come with built-in microphones. If you only have a desktop, you can invest into buying one. They’re really cheap, and usually work as plug-and-play devices, so no installation is necessary. Check out this miniature USB microphone or this tabletop microphone. Windows has a standard program for recording your voice. Find it in Start->All Programs-:>Accessories->Sound Recorder. Once you open the program and prepare the book, press Start, then begin narrating the story. When you are done, press Stop and save the file. If you need to take a break, you can stop any time and then resume the recording. The file you get will have a .WMA format which is fairly common. If the player you decide to use later does not recognize it, get a free WMA to MP3 converter. 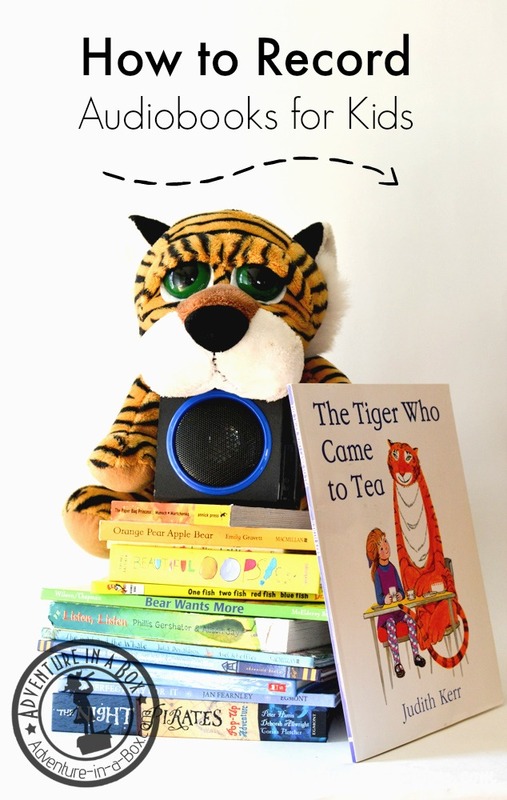 From the beginning, I wanted to have a setup that would allow my son to listen to his audiobooks independently whenever he wants to. The idea seemed simple enough: I wanted an mp3 boombox without too many bells and whistles. But it wasn’t easy to find. We’ve tried several boomboxes, and none of them worked well. The one you see beneath, for instance, is a little boombox that reads music from SD cards. It worked reasonably well for us, adults, when we wanted to listen to audiobooks, but wasn’t easy for a toddler to operate. And when we uploaded many songs and audiobooks, they would get terribly mixed-up. There was no way to separate them or create playlists. It was still the best one I found for my son, and we used it for a couple of years. Our son eventually graduated to chapter books. But by then our daughter came along, and so I was on a quest again. This time, I was luckier. 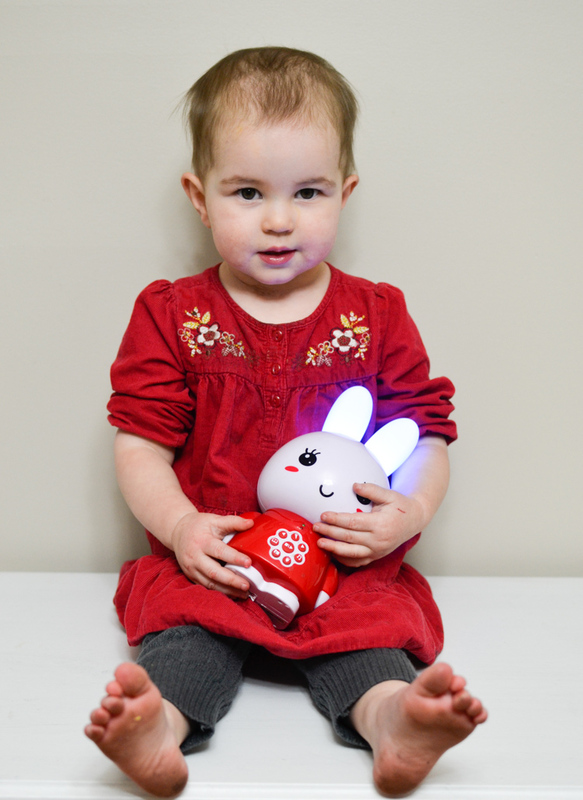 We got her the mp3 player Alilo Bunny, and it turned out great. It is easy operate: at twenty months, she figured it out right away. It comes with preloaded songs and stories, but they are easy to change. In my opinion, the best part was that different buttons are responsible for activating the audiobook mode and the music mode, so you can upload songs and audiobooks onto this mp3 player, but they will not get mixed. Last but not least: after having been dropped numerous times, it is still going strongly. 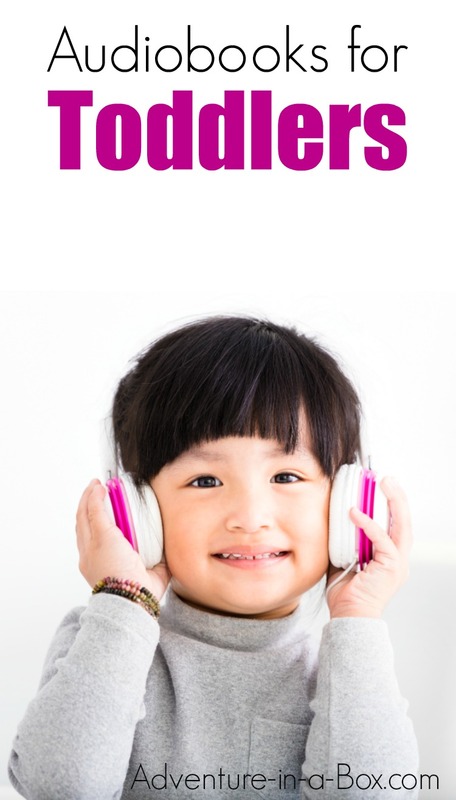 While audiobooks aren’t an alternative to reading-aloud time for us, they’re another way to enjoy books in our house. Want to know our favourite books to record? Here is the list of our favourite toddler’s books: 50 Books You Will Not Tire of Reading to a One-Year-Old. We’ve listened to audio books, but I never thought of making our own! 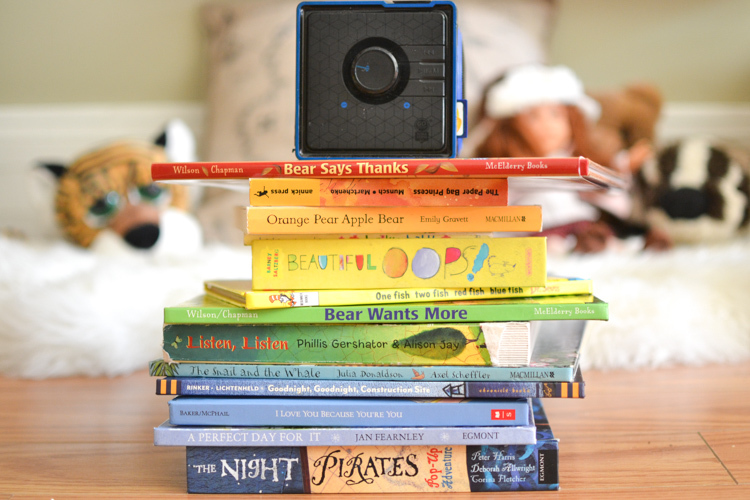 It would be great for long-distance family members to record a story, too, or a parent who has to travel! What is the blue device that you have for the CDs? This is absolutely amazing! I had NO IDEA I could do this MYSELF: of course, that’s when the laptop comes out of the shop ;( Anyway, for now, there are also apps that I have worked with on my kids iPad, where you can record voice over for certain stories, flash cards, many others. Thank you, I will be sure to pin and bookmark. (Especially since we’re practically neighbours now LOL JKG;) Ontario Mom.